Videos circulated online by abortion opponents have galvanized those on both sides of the issue. As the fight between antiabortion activists and abortion-rights supporters about the use of fetal tissue in medical research enters its third week, both sides have shifted tactics in their battle. For abortion opponents, secretly recorded videos of abortion providers discussing the procedure have brought some of the most sustained attention to their campaign in years. A new recording released Tuesday showed technicians separating the organs from an aborted fetus. The videos have unified the often-fragmented antiabortion groups and mark a coming of age for its younger activists, who have pushed to move beyond printed leaflets, graphic posters and attempts to block clinic doors, toward campaigns that can be waged online. The groups are using the videos to renew a push to cut off government funds to Planned Parenthood, which received about $500 million in those funds last year to provide women’s health services such as contraception. Its clinics also are the nation’s largest and most-organized provider of abortions. The videos “cut across every one of those divisions” about strategy, said Marjorie Dannenfelser of the Susan B. Anthony List, which supports antiabortion political candidates, and which has been pushing to cut off government funds to Planned Parenthood. The Rev. Frank Pavone, who heads Priests for Life, a group known for its use of graphic antiabortion images, has been helping to circulate the videos. He said the recordings and the digital dissemination represented a “maturing” of their strategy. Planned Parenthood officials, meanwhile, have described the videos as an attack on a scale they have never seen before. They are mounting a defensive campaign that is already entering the 2016 presidential race. Planned Parenthood leaders contend critics are attacking women’s health services more broadly and that the organization will rally support from millions of American women who have used their clinics. On Tuesday, Planned Parenthood released data from a survey it commissioned from Hart Research Associates. 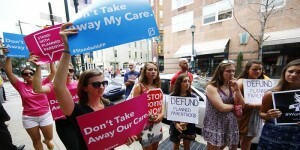 Late last week, 63% of the 800 registered voters polled said they opposed efforts to defund Planned Parenthood; that opposition went as high as 87% among Democrats, said Hart pollster Geoff Garin.